I have just returned from “Dismember the Alamo”, an 8 hour horror festival in which they show 4 films in 35mm, but don’t announce what they are until right before they show them. It was put on at the Alamo Drafthouse and hosted by Barbara Crampton, who was very nice and gracious (and dressed up like a witch for Halloween season), answered questions, talked about the movies, signed autographs, and seemed like a very pleasant individual. All the Drafthouses that participated played different movies. I know other Drafthouses played everything from Halloween III to Ernest Scared Stupid, Friday the 13th Part 4 to Of Unknown Origin, so I wasn’t sure what to expect. Of the four, the only one I had never seen was The Babadook (tho I haven’t seen any of them in an actual theater, so that was a treat). It has evidently only been shown once, at a film festival, and will be coming out in wide release this December. The presenters all made a big deal about how scary it is, and I’ve read a few reviews of it that also said it’s incredibly scary, which I figured was a bunch of hogwash (people said that about The Conjuring and many other movies, and it usually turned out to be bunk), but I have to admit, it has some effective moments. It’s about a single mother (played by Essie Davis, who I only knew from a very small role in the Matrix movies as a medic who gets killed by the Agent who possessed the body of a human) of a little boy with several psychological and emotional issues, presumably stemming from the fact that his father died while driving his mother to the hospital to have him. 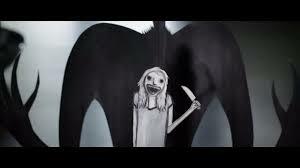 The boy finds a book on his bookshelf called Mr. Babadook and asks his mother to read it to him as a bedtime story. The book tells of a boogyman called Mr. Babadook who feeds on fear and torment, and eventually posses people, making them do terrible things. 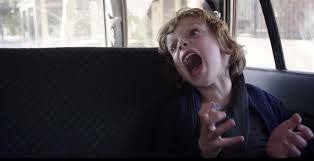 The kid becomes obsessed with the Babadook, and starts seeing him (even tho no one else can) everywhere. The mother tears up the book and throws it away, but it appears on their doorstep taped back together, and with new depictions of her being possessed by the Babadook and doing terrible things. What follows is in the highly tread tradition of The Shining, but is so well done and nicely filmed with a lot of very cool and creepy scenes (especially in the mother’s dream sequences. Now most of you know I generally do not like dream sequences, but these are not cop-outs and fake scares like in most movies) that you may forgive it being yet another ghost/ possession movie in a long line of ghost/ possession movies that have been coming out for the past 10 years (at least it doesn’t look like all the other ones. It has a very old school and original look and feel to it). But the main thing to recommend about this movie is the acting. Every person in it, and particularly the main characters (even the young boy) do incredible jobs. The dialogue and direction are fine as well. 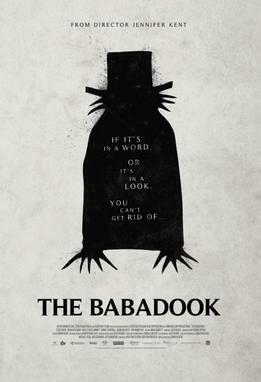 I do have a few quibbles- the budgetary constraints are slightly felt, it’s just a little bit too talky (perhaps some small edits might quicken the pace a little) and I really wish we had learned more of the mythology of the Babadook (mysterious is cool, but I love it when characters discover some engaging mythology about an interesting monster or boogyman). Also the ending needed… something (it was a little goofy), but these don’t really take away from the overall enjoyment of the film. In conclusion, this is nothing you haven’t seen before, but the level of character building, believablility, and fantastic acting as well as it’s overall theme of grief, regret, and resentment push it into the ‘a bit above average’ zone. This entry was posted in movie reviews, The Babadook (2014) by deadthyme. Bookmark the permalink.